With this Spring Loaded Tap Guide, you'll start every tap straight and precise. The spring loaded mechanism drives the 3/16" dia. 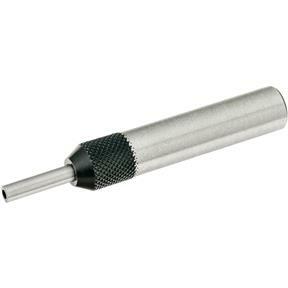 hardened tension pin and the handle is knurled for easy handling. The pin is also reversible for male and female hole centering of the tap. Packed in a plastic pouch, 1/2" shank. This inexpensive little tool should be in everyone's toolbox. Has a reversible plunger, dimpled on one end and pointed on the other, for use on any style tap base. Makes aligning the tap concentric with the hole a breeze. Simple design with few parts makes it easy to use and adjust for the job. I use it in a keyless chuck with my mill and lathe. This product is a fantastic helper to tapping holes. I have not got a crooked hole since purchasing this tool Excellent design, functionality and ease of use.